We investigate and develop novel soft wearable robots for natural interactions and symbiosis between humans and robots. Traditional human-robot interaction often requires funnelling rich sensory-motor information through simplified computer interfaces, such as visual displays and joysticks, that demand cognitive effort. We explore new forms of bidirectional and embodied interactions where humans and machines interact and feel with their entire bodies. We are especially interested in human symbiosis with non-anthropomorphic machines that operate at different spatial and temporal scales, such as small flying machines. C. Rognon; M. Koehler; C. Duriez; D. Floreano; A. M. Okamura : Soft haptic device to render the sensation of flying like a drone; IEEE Robotics and Automation Letters. 2019-07-01. DOI : 10.1109/LRA.2019.2907432. V. Ramachandran; J. Shintake; D. Floreano : All‐Fabric Wearable Electroadhesive Clutch; Advanced Materials Technologies. 2018-10-23. DOI : 10.1002/admt.201800313. A. Tonazzini; J. Shintake; C. Rognon; V. Ramachandran; S. Mintchev et al. : Variable stiffness strip with strain sensing for wearable robotics. 2018-07-09. 2018 IEEE International Conference on Soft Robotics (RoboSoft), Livorno, April 24-28, 2018. p. 485-490. DOI : 10.1109/ROBOSOFT.2018.8405373. 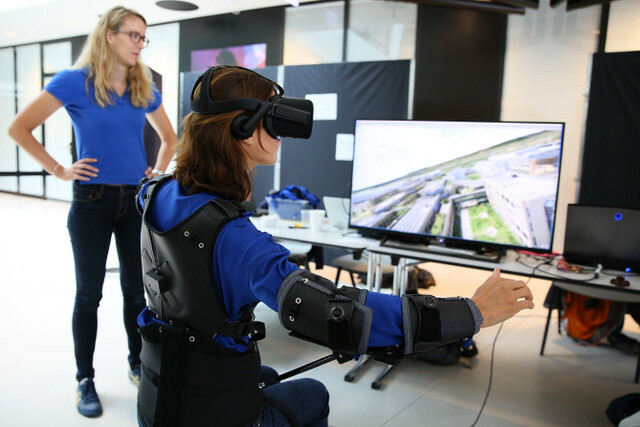 C. Rognon; A. Wu; S. Mintchev; A. Ijspeert; D. Floreano : Haptic Guidance with a Soft Exoskeleton Reduces Error in Drone Teleoperation. 2018. Eurohaptics 2018, Pisa, Italy, June 13-16 2018. J. Shintake; E. Piskarev; S. Jeong; D. Floreano : Ultra-stretchable strain sensors using carbon black-filled elastomer composites and comparison of capacitive versus resistive sensors; Advanced Materials Technologies. 2018. DOI : 10.1002/admt.201700284. M. Dobrzynski; S. Mejri; S. Wischmann; D. Floreano : Quantifying information transfer through a head attached vibrotactile display: principles for design and control; IEEE Transactions on Biomedical Engineering. 2012. DOI : 10.1109/TBME.2012.2196433. W. Karlen; D. Floreano : SleepPic. Hardware Developments for a Wearable On-line Sleep and Wake Discrimination System. 2011. BIOSIGNALS 2011 - International Conference on Bio-inspired Systems and Signal Processing, Rome, Italy, January 26-29, 2011. p. 132-137. W. Karlen; D. Floreano : Adaptive Sleep-Wake Discrimination for Wearable Devices; IEEE Transactions on Biomedical Engineering. 2010. DOI : 10.1109/TBME.2010.2097261. W. Karlen; S. Cardin; D. Thalmann; D. Floreano : Enhancing Pilot Performance with a SymBodic System. 2010. 32nd Annual International IEEE EMBS Conference, Buenos Aires, Argentina, August 31 - September 4, 2010. p. 6599-602. DOI : 10.1109/IEMBS.2010.5627127. W. Karlen : Adaptive wake and sleep detection for wearable systems. Lausanne, EPFL, 2009. DOI : 10.5075/epfl-thesis-4391. P. Dürr; W. Karlen; J. Guignard; C. Mattiussi; D. Floreano : Evolutionary Selection of Features for Neural Sleep/Wake Discrimination; Journal of Artificial Evolution and Applications. 2009. DOI : 10.1155/2009/179680. W. Karlen; C. Mattiussi; D. Floreano : Sleep and Wake Classification With ECG and Respiratory Effort Signals; IEEE Transactions on Biomedical Circuits and Systems. 2009. DOI : 10.1109/TBCAS.2008.2008817. W. Karlen; C. Mattiussi; D. Floreano : Improving Actigraph Sleep/Wake Classification with Cardio-Respiratory Signals. 2008. 30th Annual International Conference of the IEEE Engineering in Medicine and Biology Society, Vancouver, BC, 20.-25.8.2008. p. 5262-5265. W. Karlen; C. Mattiussi; D. Floreano : Adaptive Sleep/Wake Classification Based on Cardiorespiratory Signals for Wearable Devices. 2007. Biomedical Circuits and Systems Conference, BioCAS 2007, Montreal, 27.-30.11.2007. p. 203-206. DOI : 10.1109/BIOCAS.2007.4463344. M. Baechlin; K. Foerster; J. Schumm; D. Breu; J. Germann et al. : An automatic parameter extraction method for the 7x50m Stroke Efficiency Test. Third International Conference on Pervasive Computing and Applications, 2008. ICPCA 2008., Alexandria, Egypt, October 6-8, 2008. DOI : 10.1109/ICPCA.2008.4783628.